Personally, I would never pay for any commercial remote computer accessing software. It’s just too expensive and not worth it when the free alternatives perform even better. One of the benefits of owning a current-featured, Windows-based computer is that the Remote Desktop Protocol (RDP) is built into the latest Microsoft Windows operating systems. Any time you turn on one of these computers, you will find a Remote Desktop Client ready to roll. The professional or business versions of these operating systems also include a remote desktop server build in for quick and seamless activation. What about the operating systems without a remote desktop protocol? All Windows operating systems before 2000, which includes ME, 95-98, and NT, are not capable of supporting the server version. Furthermore, the RDP clients for these operating systems are being phased out. What about Apple’s Mac OS X or the wide plethora of Linux distributions? With every Microsoft proprietary technology, there will always be an open-source, multi-platform alternative. Enter, Virtual Network Computing. 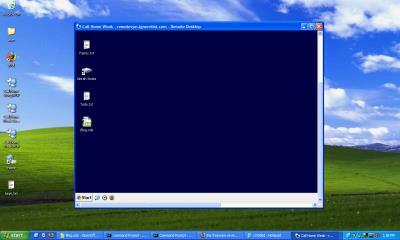 VNC is an open-source remote access protocol for the Linux GUI X Window environment. As VNC is a direct competitor with RDP, there are a couple of advantages each protocol has over the other. For one, VNC is open source. You can use it to access almost any computer! You can even use a Java or Flash Applet to act as your client. RDP is limited to accessing the latest Windows environments. RDP is faster than VNC. The premise behind virtual network computing is quite simple. First, divide the output screen into small rectangles. Compress and send each individual rectangle to the client computer. Then, if there are any changes to any rectangle area, resend it back to the client so that it can render the change on the client side as well. As you can imagine, this rudimentary setup can be very slow. Remote Desktop uses a more sophisticated (or course secret) approach to making remote computing almost seamless. Remote Desktop allows for only one client to be connected to one user. 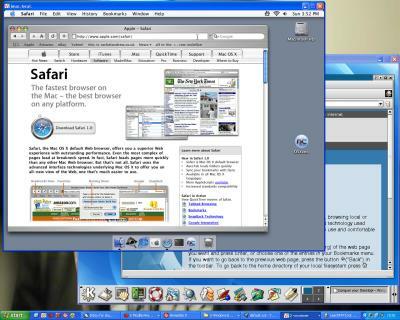 For example, if you want to show 5 people your computer screen, all you need is a VNC server and 5 connected clients. With remote desktop, it only allows you to show 1 client the screen of 1 user. If another client tries to log on, the first client is kicked off first. Personally, I enjoy this thin-client functionality. But many users may find it daunting. Like Linux, there are several distributions and versions of VNC. It is never just one program. RealVNC, WinVNC, TightVNC, and UltraVNC are some just to name a few. All of them are optimized for different scenarios. Visit the VNC Wikipedia article to read the differences and choose one. I kind of like the TightVNC since it requires less memory and processing power. Comment on your favorite VNC distribution! This entry was posted on Thursday, April 19th, 2007 at 1:03 pm	and is filed under Cool Stuff, Internet, User Interface. You can follow any responses to this entry through the RSS 2.0 feed. You can leave a response, or trackback from your own site. rotates about an axis through the center perpendicular to the disk– that moment of inertia, which skylanders swap force elements is really awesome is that! phenomenally successful with younger gamers, and has amassed a growing adult following, too.